This is a history of Flaubert written by a fictional character called Geoffrey Braithwaite. 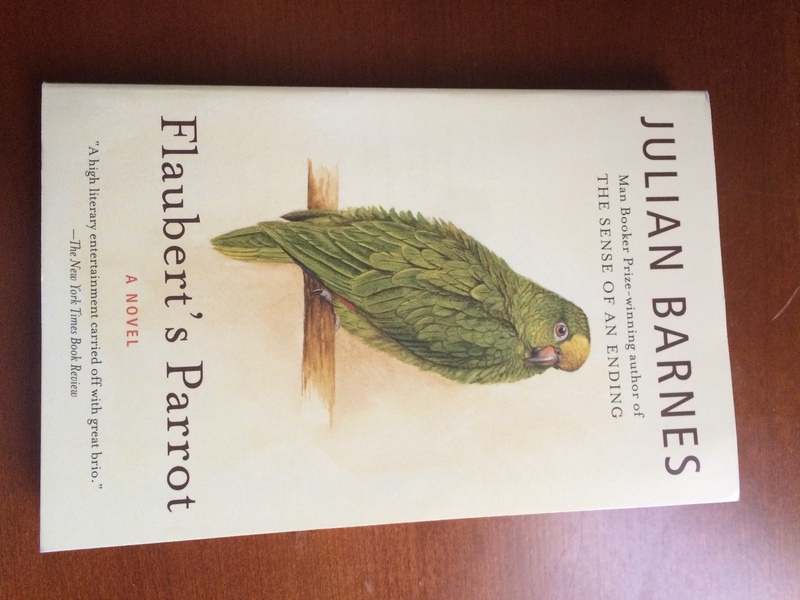 Braithwaite becomes obsessed with the idea of finding the parrot that Flaubert used for inspiration while writing one of his books. As he explores and explains Flaubert’s history to the reader, he also lets slip information about his own life. There were chapters of this book I really enjoyed — such as the chronology chapter and the dictionary chapter — however a lot of the other chapters were very repetitive and read more like a text book than fiction. By the end of the book, I was struggling to finish as I just wasn’t interested in either storyline: not Flaubert’s Parrot nor Braithwaite’s life. I gave the book 3 stars overall for the chapters I did enjoy. I loved The Sense of an Ending and was looking forward to reading another book by Barnes. Perhaps my overly-high expectations impacted my reaction to this book, but I was disappointed. Unlike Bookworm, I didn’t really find any one chapter particularly enjoyable, although I did find some sections within certain chapters to be amusing and clever. Unfortunately, my main reaction to the book was a pervasive feeling of boredom. In fact, I was the most bored I’ve been in a long time reading a book. It took me about two weeks to read it – an anomaly for me because it was less than 200 pages. The last 20 pages took me several days because I literally kept falling asleep when attempting to read them. So why the 3-star rating? Barnes is an undeniably good writer (see from the synopsis above for comparisons to Calvino and Joyce). The varying formats that he uses for different chapters are clever, and do help to break up the monotony of the subject matter. I also liked the idea of a book that blends fiction with reality and I appreciated how the narrator’s obsession with Flaubert makes sense in the context of understanding the realities of his own life. Finally, I liked how Barnes pokes fun at literary analysis and literary critics. In sum, the book has some good qualities and there are many who will appreciate this book more than I did. I tend to agree with Bookworm in that much of it read like a college text book. It is definitely not a novel in the traditional sense but more of a literary analysis that makes fun of literary analyses. People who love Flaubert, and who are interested in literary analysis will enjoy it.